October | 2015 | I run. Quite a lot. It makes me happy. 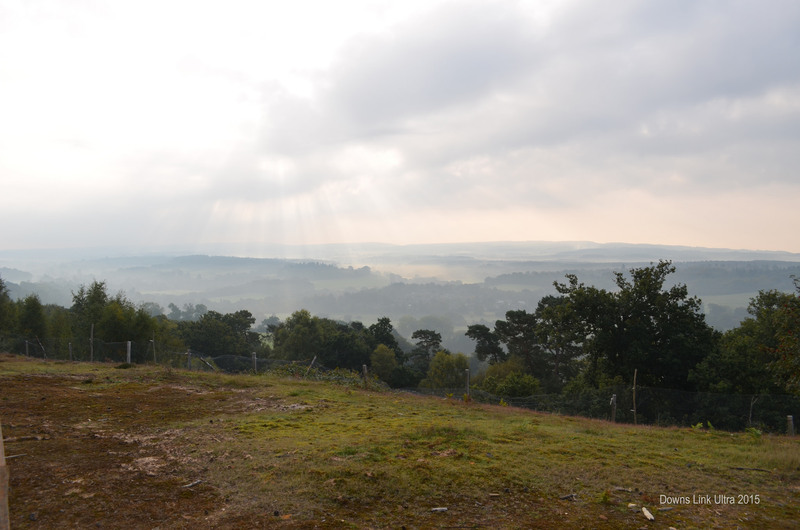 I’m starting to think that the Sussex Trail Events people have friends in high places. Nick and I had the week off before the Downslink Ultra this year and it was glorious all week including the day of the race, with the forecast predicting a downturn immediately after the race finished. This wasn’t all positive, however. After 2 lovely days out celebrating our wedding anniversary in Brighton and Hove on Monday and Tuesday, I decided to hack away at the out of control hedge at the front of our house on Wednesday. This is a cardinal sin during the week before a race, resulting in a shooting pain down my back and left leg and a couple of days on the sofa trying to make it better. So, race day comes. I’m pretty excited and managed a proper sleep the night before. Nick’s nervous, as it’s the longest she’s been and she’s concerned about spending so much time out running without any hills. Some people will do anything for an excuse to walk, even if it means finding some hills. 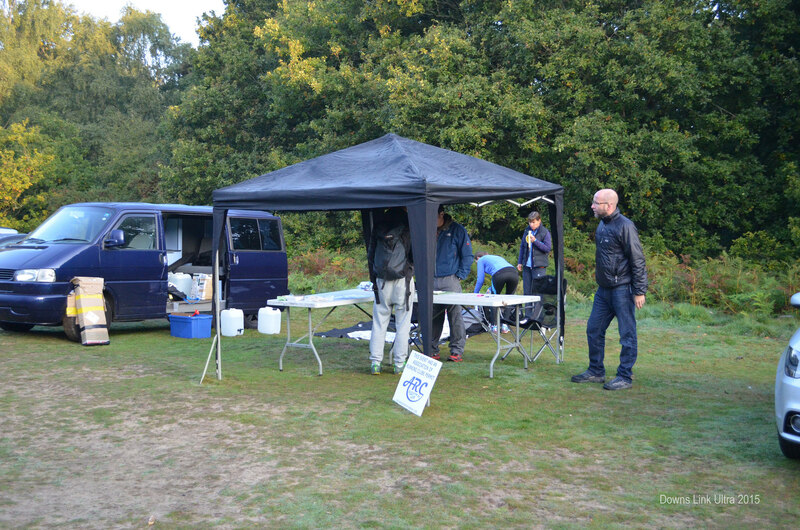 We packed everything the night before, so there was no panic on Sunday morning, just a nice relaxed breakfast before the Lavis family arrived to take us to the start (Jon, Jan and Claire were the tail runners for the day). 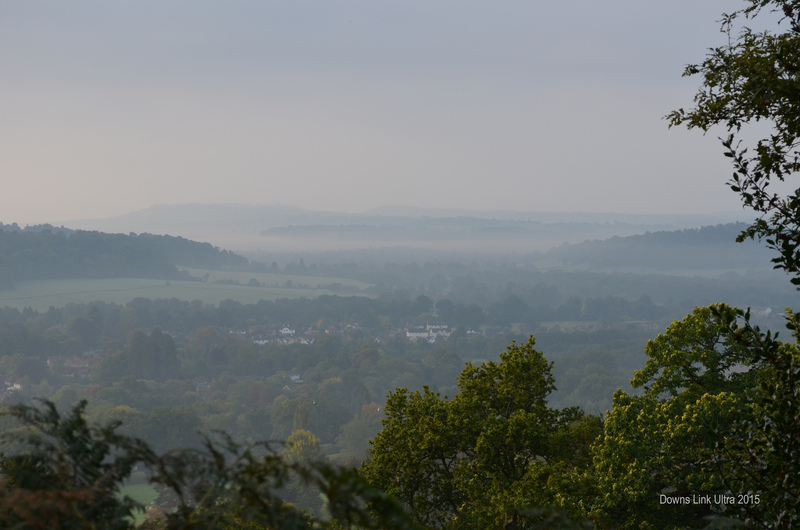 It was cold, but sunny and it was nice to be in lovely surroundings and with some familiar faces at St Martha’s Church in the Surrey hills near Guildford. Registration is quick, easy, organised and relaxed. 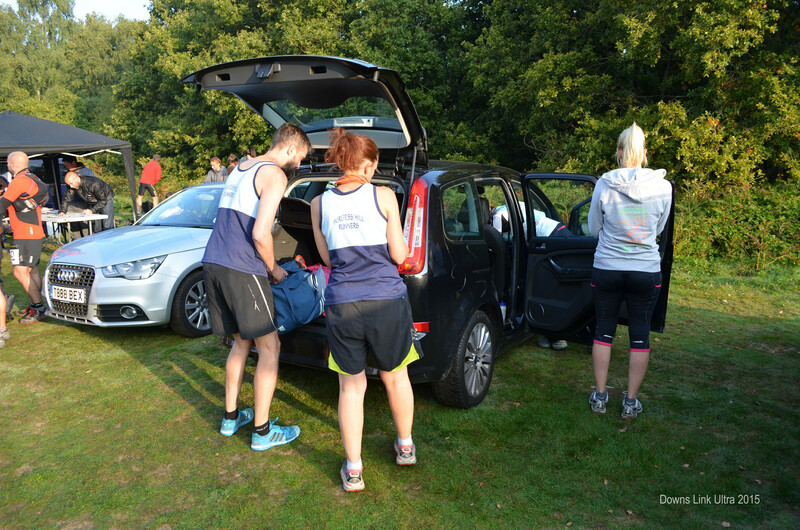 After a few last minute preparations, we headed up the hill from the car park to the very picturesque start area where we received last minute instructions before we head off down the steep hill on the sand, careful not to get any sand in our shoes. The plan is not to start off too quickly. As it happens, it wasn’t possible given the steep downhill and the inevitable bunching caused by the fact that we met a horse on the way down the narrow section about 500 metres in. The first section is the only part of this course that you could really consider as having any hills, but they are more like inclines. As planned, I did walk up them though. After about 4 miles you get onto the Downslink itself and from then on you just follow the signs. It’s either completely flat, slightly up or slightly down (with the odd proper bit of hill thrown in). I soon got into a really good rhythm which would get me to the end close to my target time. I completed the first half marathon in 2 hours 15 minutes. I split this race into thirds. That’s 2 half marathons and then 12 miles and given the inevitable slow down towards the end, the aim is to get the 3 sections to be pretty equal. 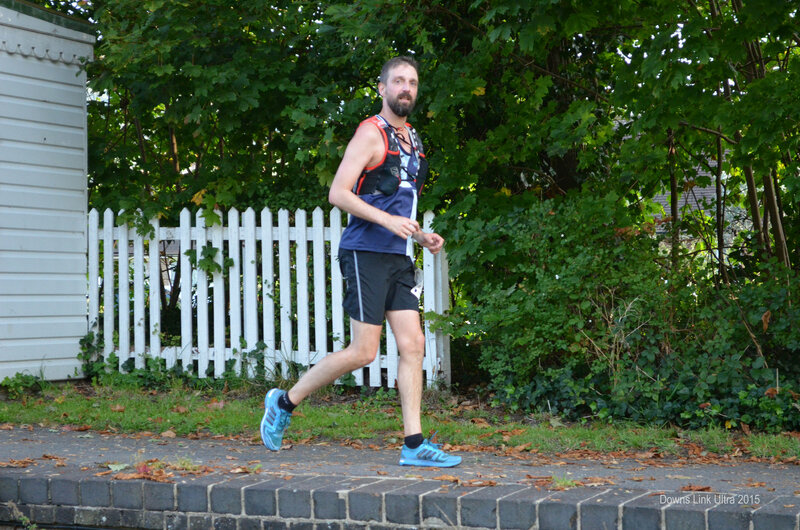 Jon was at Rudgwick Station at the half marathon point and I was still looking calm and at this stage well in control. To be fair, if I wasn’t, there was still a hell of a long way to go and I’d be in trouble. So, the second half marathon starts. The route is more of the same. The Downslink path doesn’t change much. It’s punctuated in certain places, especially near Christ’s Hospital on this section where so spend 15 minutes on the road and there is a climb to get back onto the Downlink path. I had been on my own for some time now. I had been with a large group up to around the 10 mile mark, but apart from overtaking a few people, it was pretty solitary. I like that. It’s just me and the little things ticking round inside me head. Once back on the path after Christ’s Hospital at the 19 mile mark, there is a lot of downhill. 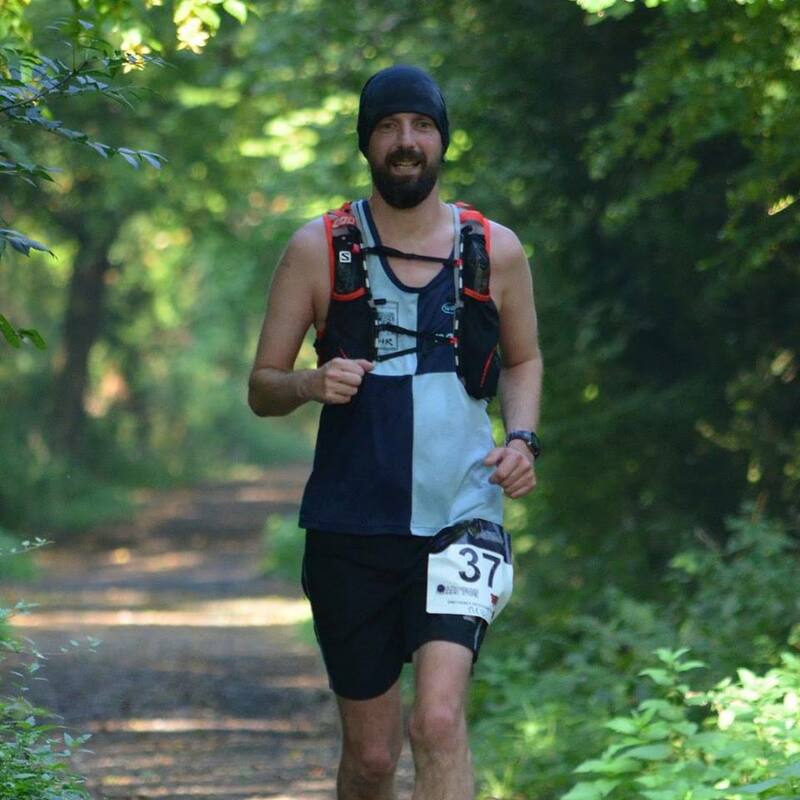 That’s probably how Jon managed to take this picture of me still smiling and looking good at 20 miles. Yes, this is a smile. It’s as close as I get to a smile when me and running meet. I am incredibly joyous on the inside though. This is where Jon was due to take over from Jan and Claire as tail runner, as they did the first 20 miles. The second half marathon was a little slower. I got there in 4 hours 34 minutes. I must admit, I’m slightly disappointed by that. I had hoped to run the first 2 half marathons in similar times, but the second one for 4 minutes slower. Mind you, there was an extra aid station in the second half marathon, so maybe I shouldn’t be so hard on myself. I am now back on very familiar territory. I have run a lot of the last section on many occasions in training and other races. 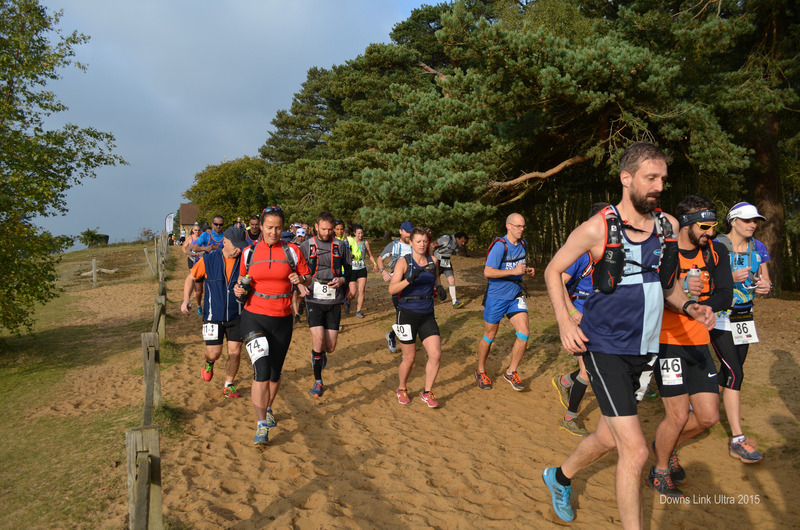 The next big goal is to get the the aid station at the Cat and Canary at Henfield. This is a big boost as it is manned by my club, but it was a bit mad when I got there. It is around the 46 km mark and apart from Jon, I hadn’t really spoken to anyone for about 2 hours. To be greeted by around 20 people, all so encouraging, helpful and happy to see you was a bit weird. 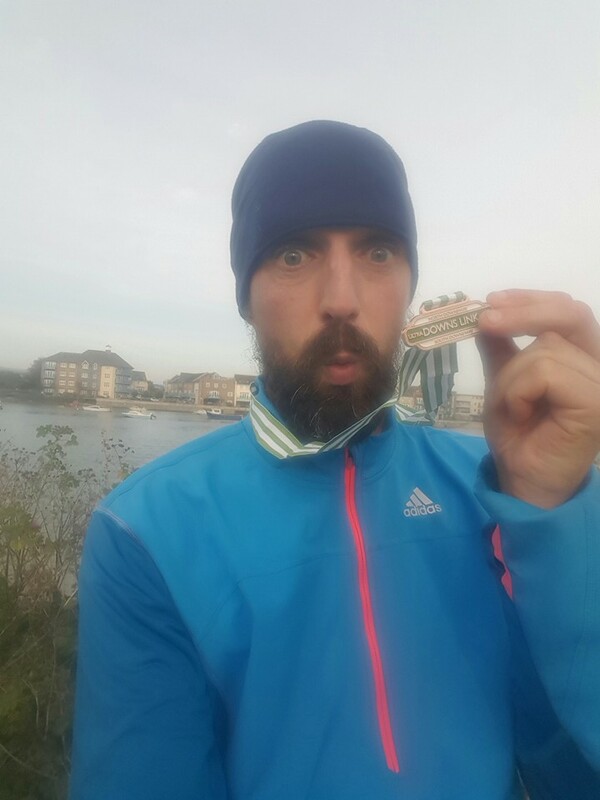 I was so grateful for their support and was aware that I wanted to thank everyone for being there, but the main things on my mind were to get the water refilled, Zero tablets in the water, salt tablet down, a bit of food and off again before my legs stopped and the target time disappeared. There was obviously enough time to pull a stupid face. So, just ten or so miles left. I still felt OK. Tired, but OK. My km times were slowing. Whereas up to marathon distance they started with a 6, they now started with a 7. This is what I was expecting, but I’m so pleased with how the last section went. I overtook quite a few people. I didn’t walk (apart from the uphill bits). Many of the km splits were down towards 7 minutes and one even went below 7 minutes. It’s amazing what a bit of grit and determination can do, along with the desire to get under the time from last year. 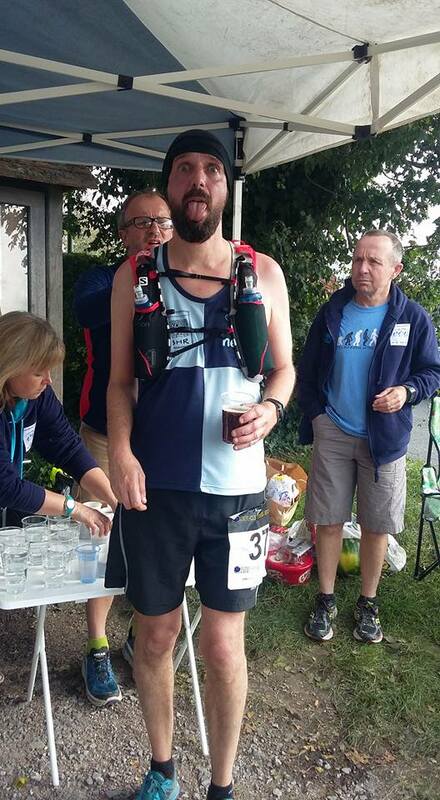 I went through the last aid station very rapidly, just a quick drink and a bite to eat and off for the last 6 km. This is were the course PB went out of the window. There was a change to the course from last year, which added over 5 minutes. The change made total sense in order to avoid crossing a really busy road. Legs with well over 30 miles in them and a busy road are a recipe for potential disaster. I kept pushing. The third and second from last km’s were almost bang on 7 minutes. I crossed the wooden bridge in Shoreham to get across the River Adur. Until last week this had been the location of the floral memorial to the victims of the air disaster. As I crossed the bridge, my thoughts turned to them. On many occasions during runs like this I remind myself how lucky I am, especially when it’s tough. I’m fit, healthy, surrounded by loving supportive people and I get the chance to be out in the countryside doing something that I love. This really came home crossing that bridge. So, there’s about a kilometer left and I tried to get home under the time from last year, but the uneven flagstones along that stretch made it too tough and I was 40 seconds out. But there you go, what’s 40 seconds between me and my friend, the Downslink Ultra (especially given that there was an extra loop)? I got home in 6 hours 55 minutes, which means that the last section of the race was 2 hours 22 minutes. Slower than the first 2 sections, but very pleasing non the less. I am happy to be getting near to the finish line. Honest. I’m just very good at not showing it. Thanks for this picture Sarah and for handing me my medal. This medal is so precious. It’s the smallest one I’ve got and I now have 2 of them. 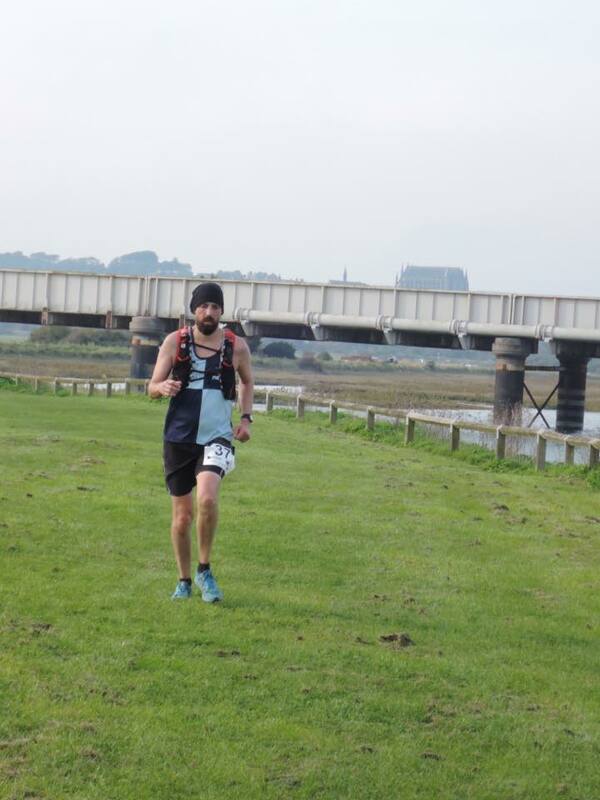 So, I have done a few of these off road marathons now, so I’m getting used to them and learning from previous mistakes. The positive things to come out of this one are that the feeding and watering worked well. I carried Nakd bar bite size pieces, which I ate regularly and tucked into a bit of savory and sugar at each aid station. I drink sugary drinks at each aid station and filled up my water bottles including a Zero tablet in each bottle. I also took a salt tablet at each aid station and I didn’t cramp once. My pacing was pretty much spot on. OK, I slowed down towards the end, but that was always going to happen. The only thing that went wrong was screwing up my back the week before. Don’t do gardening the week before a race kids. It’s not the way forward. My post race thoughts are mixed. I was looking to build to a 50 mile race, probably in 2017. I am currently very unsure about whether this is the way forward. Going over marathon distance is very tough. However, my thoughts on this race are incredibly positive. 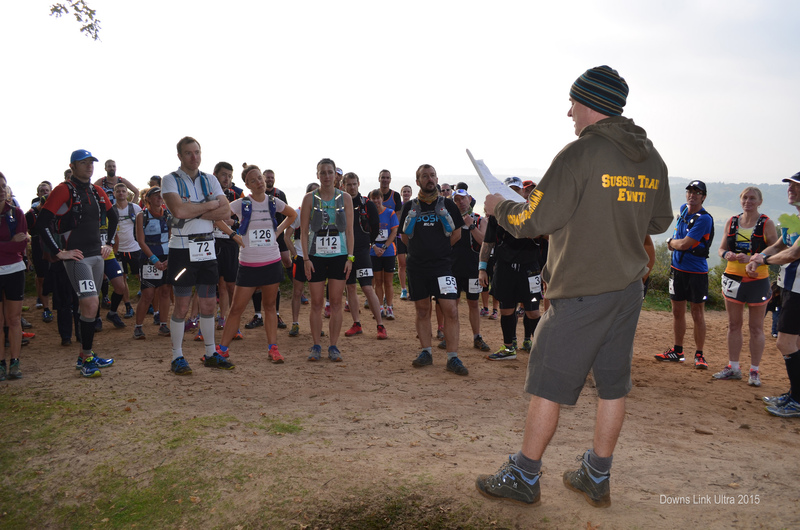 The events organised by Sussex Trail Events are fantastic. Whether it’s your first or your 100th marathon, it doesn’t matter. These events are relaxed, welcoming and the organisers are great fun to be with. If you are thinking of stepping up from marathon distance to a real ultra distance, this is perfect for you. Sadly, I don’t have any of the photos that I took out on the course, as my phone has decided that it’s not happy with the world and the photos have been lost. All of his videos are brilliant and this is no exception. All of the photos of the event on this blog are supplied by Jon Lavis and Paula Ridley. Thank you both very very much. 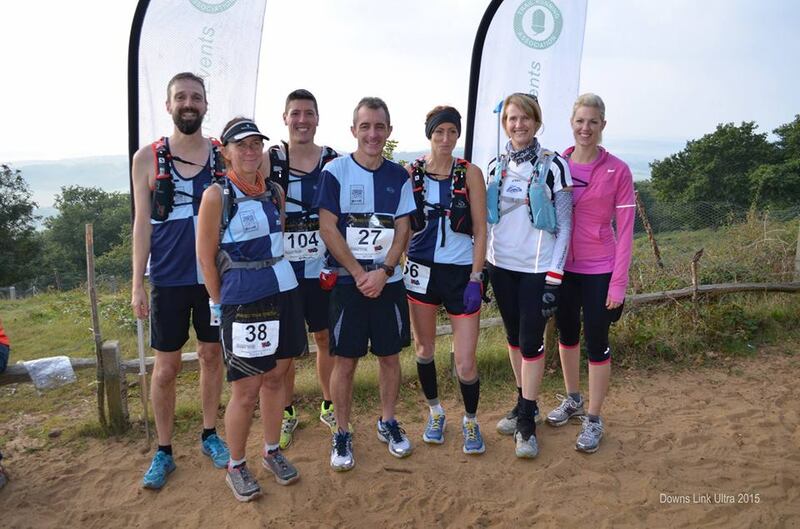 Thank you to the Lavis family for everything, not just the lift to the start and thank you to all of the Burgess Hill Runners out there on the course and at the aid station. Being able to give Wayne some cockney abuse at a low point really picked me up. Thank you to Sussex Trail Event and all of the volunteers for making this happen.